Instructions for putting hourly offers in your emails (or web pages). The above example uses a simple banner smartblock for each offer and has a second slot showing an animated countdown timer. Q: Is it clickable? A: Yes, like all our real-time content. Q. Can I use the same Slot in web and email? Yes, of course. We organize slots as two separate groups, for "Email Personalization" and "Web Personalization", because in our experience marketers almost always use different creative in these two places. But if you want you can use slots from either group in web and email. Q. 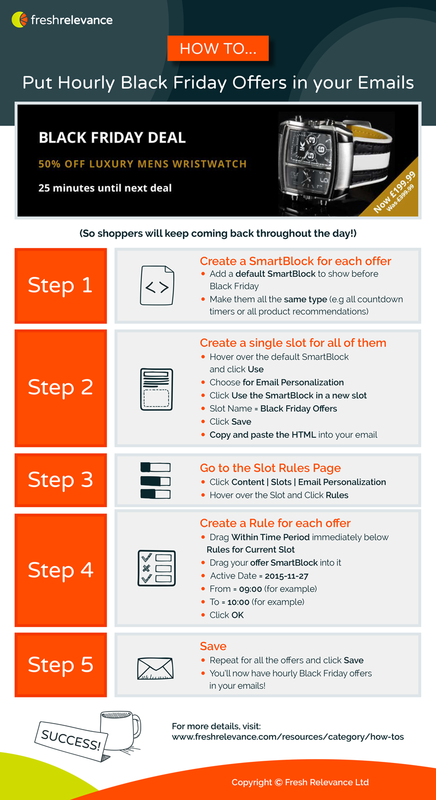 Can I edit the SmartBlocks and Slot Rules in real-time, to change what shoppers see, even after emails have been sent? For example if I made an error, or the main product that I'm promoting goes out-of-stock? A: Yes of course. Q: I've run out of time! Can you do this for me? A: Yes, of course. Contact us for details ASAP.